The Tamil Nadu Chamber Foundation is organising the 2nd Vibrant Tamil Nadu Expo (Food Edition) 2019 on 12-15August 2019 at the IDA Scudder Trade Centre, Velammal Medical College Campus, in Madurai, Tamil Nadu. The event will serve as a platform for all food products players, both national and international, to present a wide variety of products that includes agricultural and food products, food raw materials and ingredients, processed and canned foods, beverages, fruits and vegetables, ethnic and organic foods, millets and other novel and innovative food items. For more information, please see the Brochure and the Invite as well as the website www.vibranttamilnadu.com. For more information, you are welcome to contact the Tamil Nadu Chamber Foundation through +91-7538870222 / +91-9791999732 or info@vibranttamilnadu.in. The National Cooperative Development Corporation (NCDC) is organising the first ever “India International Cooperative Fair (IICTF) on 11-13 October 2019 at Pragati Maidan, New Delhi. It aims to have domestic participation from cooperatives of at least 15 Indian States / Union Territories as well as international participation from different trade regions across the world. International buyers can be from the cooperative, corporate, private and government sectors. IICTF covers exhibitors / sellers / buyers who have promary focus on the cooperative-to- cooperative trade on sectors such as agriculture and allied sectors (complete value chains), commodities, exports, technology, climate smart agriculture, processing, packaging, storage, machinery, brand promotion, marketing, coop-banking, IT, cybersecurity, livestock, dairy, fisheries, handloom, handicrafts, textiles, consumer goods, retail, hospitality, insurance, finance, healthcare, products by women groups and capacity development. NCDC suggest early registration since the Trade Fair has already evoked a lot of enthusiasm amongst Indian cooperatives. The basic exhibition space units are of 9 square metres (3x3) size. For more information, please see the pamphlet and the website. You can also contact the IICTF cell in NCDC at +91-1126962478 / 26960796 or iictf@ncdc.in. Furthermore, Mr Sundeep Kumar Nayak, MD, NCDC can be reached on +91-9868849773 or mdncdc@ncdc.in / chairman@nedac.info. Organised by the Pesticides Manufacturers and Formulators Association of India (PMFAI), the 14th Agrochemical Exhibition in New Delhi (NCR) is scheduled to take place from 10-13 November 2019 in New Delhi (NCR), India. The event will provide an opportunity to meet top leading Indian Agrochemical Companies that will exhibit in the event, with 60 booths exclusively for agri-inputs (agrochemicals, fertilisers, biological pesticides and ancillary units). Visiting delegates can discuss business with these Indian companies for Joint Ventures, Joint Research & Development, Contract Manufacturing, Expansion of Distribution Networks, Product Procurement & Plan Procurement. A two-day conference with workshops will be organised on the sidelines of the exhibition; it will deal with Research & Development, Market Analysis and Registration Procedures in regard to the event. The PMFAI can assist visiting participants in forging business alliances as per their requirements and arrange for factory visits, requested in advance. 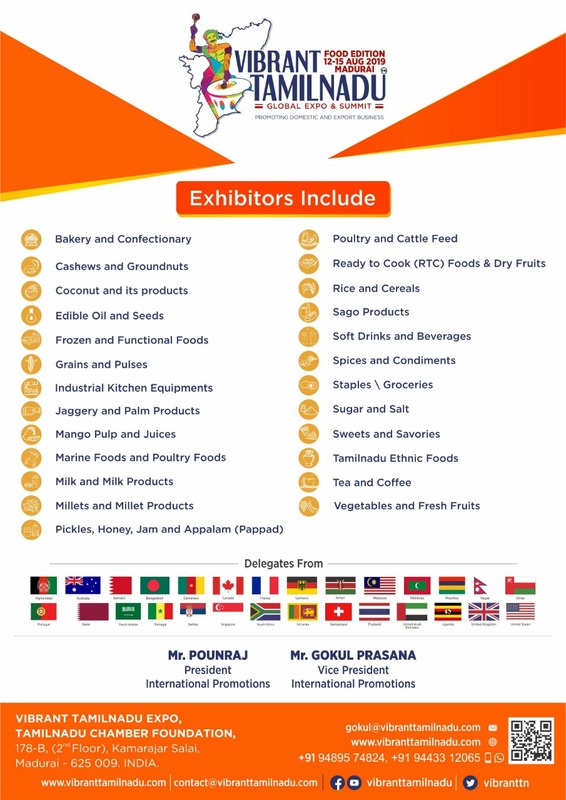 India ITME Society’s Overseas Exhibition ITME AFRICA 2020 will take place on 14-16 February 2020 at the Millenium Hall, Addis Ababa, Ethiopia. This unique and exclusive business event will have the theme “Prosperity for AFRICA through Textile Technology”. This prestigious International Textiles & Textile Engineering Exhibition is supported by the Ministry of Textiles, Government of India; the Federal Republic of Ethiopia; the Ethiopian Textile Development Institute and the International Trade Centre as Trade & Investment partner facilitating business connect in India & Africa especially with Ethiopia, Kenya, Burundi, Tanzania, Somalia, Uganda, Rwanda, Djibouti, Eritrea, etc. ITME AFRICA 2020 is an unprecedented opportunity for international companies to explore joint ventures, business collaboration, technology transfers and investment, especially for sourcing companiesthat want to expand and access upcoming Textile markets in Africa. As an unprecedented joint venture, the India ITME Society, the Ethiopian Chamber of Commerce and Sectoral Association (ECCSA) – a premier organisation in Ethiopia – and the International Trade Center – a development agency that is fully dedicated to supporting the internationalisation of small and medium-sized enterprises (SMEs)– are bringing to the table this unique and exclusive business facilitator, opening up an entire continent of new opportunities. Detailed information is available onwww.itme-africa.com. For more information on business opportunities in the Textile Industry in Africa seehttp://india-itme.com/documents/ITME_2020_Opportunities_in_Africa.pdf. The third edition of ‘INDUSFOOD’ is scheduled to take place on 8-9 January 2020 at the India Expo Mart in Greater Noida (Uttar Pradesh). The event is aimed at promoting India as a competitive exporter of quality food and beverage products to the world. About 450 top exporters from India’s food and beverage industry will be participating. Over 650 pre-screened hosted buyers will be invited from across the world to take advantage of the excellent platform for doing business with Indian food and beverage businesses. The event builds upon the success of this year’s INDUS FOOD 2019, which attracted 730 buyers and reportedly generated business worth approximately US$ 1.2 billion. 384 reputed Indian exporters/exhibitors participated and displayed their products. For more information about the upcoming event and the incentives offered, please seewww.indusfood.co.in/. World Expos are held once every 5 years and are a 6-month long exposition providing an opportunity to the participating countries to present the latest and best in technology and new ideas to the global market. It is the world's largest meeting place, bringing together countries, the private sector, the civil society and the general public around interactive exhibitions, live shows, workshops, conferences and much more. The exposition in Dubai aims to bring together the world under a central theme of Connecting Minds, Creating the Future. The overall broader theme will be based on three sub-themes - Opportunity, Mobility, and Sustainability. 190 countries have confirmed their participation at the Expo, which is likely to attract a footfall of about 26 million people from across the world. India is a Strategic Partner for the World Expo 2020 in Dubai and has one of the best plots for the country pavilion. India's showcasing will be dynamic, presenting a constantly moving exposition over the six months.